Derivatives 2015 provides insight into how the global derivatives industry has evolved in response to waves of regulation and examines the challenges that lie ahead. It explores the ways that the various constituencies within the derivatives industry – regulation, brokerage, clearing and technology – are adapting and innovating. It also spotlights asset classes that are facing more acute challenges, such as commodities, OTC and equity products. 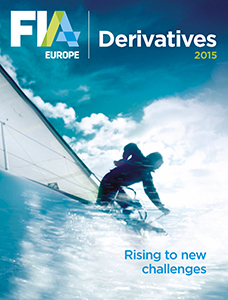 Derivatives 2015 was launched at FIA’s International Futures Industry Conference in Boca Raton in March 2015.